This is one of those stories that demands no elaboration. 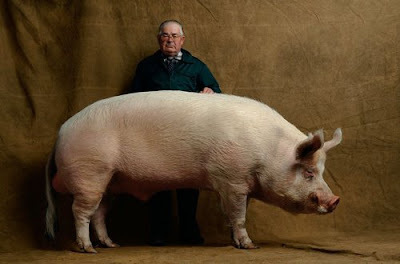 "A pig named Bruce held an elderly woman hostage in her home in eastern Australia after she befriended the juvenile swine, which is the size of a Shetland pony." Oh my gosh I don't believe it. How do you find these things? Wow. That is wicked rad. I really don't know what to say... O-o"
Or should I say holy pig? I thought that you said it was a woman. what's with the random man behind the pig?! Kirsten, i don't know if you've already written about this but i don't think u have....you should write about NASA and their rubber duck scheme!! it's so cool! !